Now, a new study conducted by Hart Research on behalf of the Solar Energy Industries Association, shows that Americans of all stripes are still fully in love with solar. 92 percent of voters believe it’s important for the US to develop and use more solar energy. 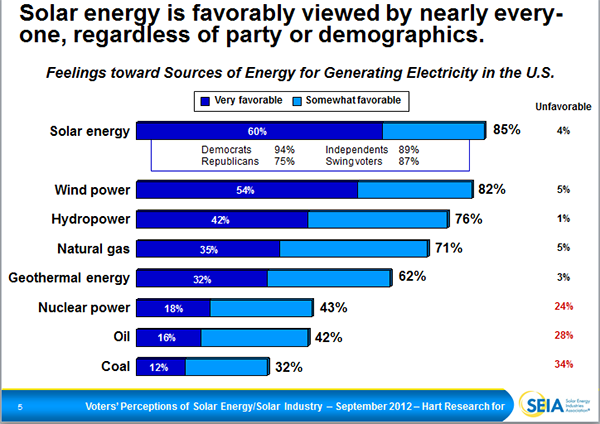 85 percent of voters view solar energy favorably (60 percent very favorable). 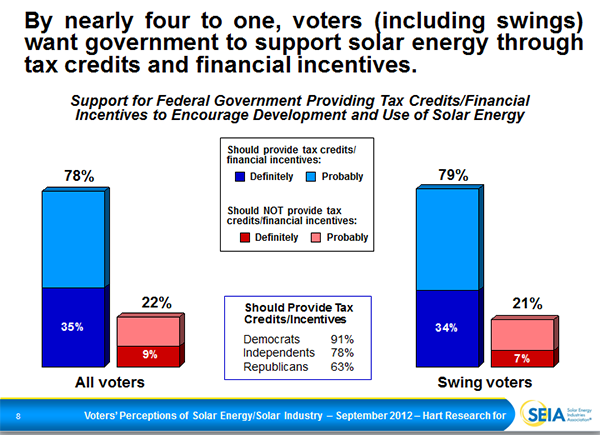 78 percent of voters say government should support growth of solar energy with incentives. 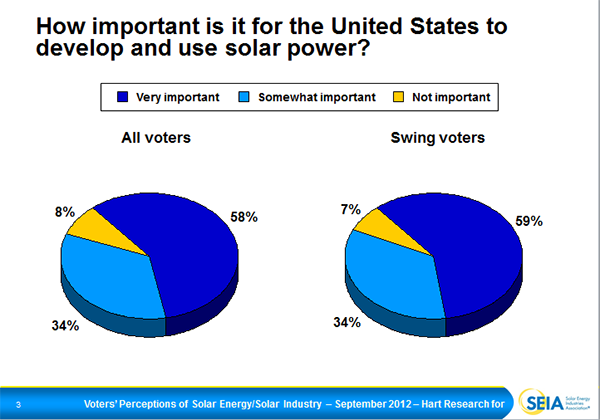 9 of 10 voters (92%) believe it is important for the United States to develop and use solar power. Fully 85% of voters have a very favorable (60%) or somewhat favorable (25%) view of solar energy, including 87% of swing voters. This places solar ahead of wind power (82%), hydropower (76%), natural gas (71%), geothermal (62%), nuclear power (43%), oil (42%), and coal (32%). If there’s one issue worth supporting loud and clear and basing an election on, its clean energy, and especially solar. Clearly, that’s not what the Romney/Ryan ticket is doing, and even the Obama administration isn’t being very clear about it. Obama’s energy message is all about “all of the above” — I wonder how much more popular he might be if he went on a really strong clean energy push with a focus on solar? Voters identify solar as the energy source they are most eager to have the federal government and U.S. policy support through tax credits and financial incentives. In fact, when presented with eight different forms of energy that the federal government should encourage (in addition to the option of saying none), 64% of voters, including 67% of swing voters, say that solar should be on that list (the next highest is wind power at 57%). 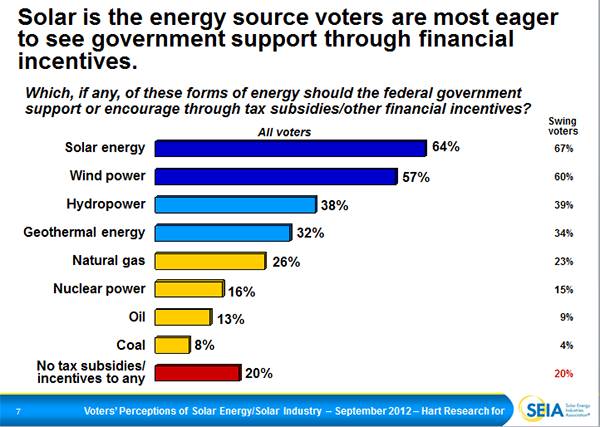 Taking their enthusiasm for government support to the next level, 78% of voters say the federal government should provide tax credits and financial incentives to encourage the development and use of solar energy and only 22% say the federal government should not do this. This sentiment is shared by swing voters (79% to 21%), as well as by Democrats (91% to 9%), independents (78% to 22%), and Republicans (63% to 37%). Yes! And yes, please — give us more solar!